The theme selected for week one-seventy of Operation Graphite will be: Jurassic World. More Dinosaurs, I know, i’m totally juvenile. I’ve said if before – if there is an age where dinosaurs stop being awesome, I never want to reach it. Even if the last two Jurassic park movies were a little weak, they still had Effing dinosaurs. 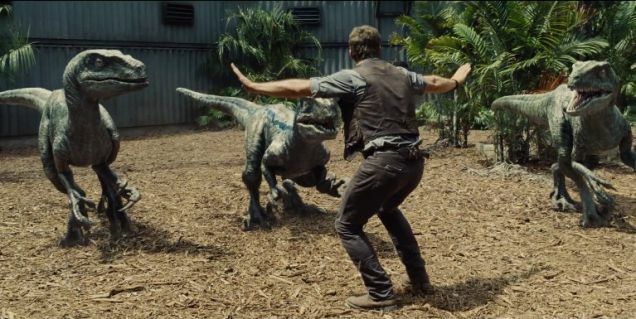 Now we’ve got Andy Dwyer, Starlord himself as a velociraptor tamer. Actually deinonychus would be the accurate dinosaur for that size, Velociraptors were actually the size of turkeys. So yay, more dinosaurs. The movie looks absolutely ridiculous, but who knows, maybe it will be ok. Either way, dinosaurs dude. Please submit any drawing or painting, using traditional or digital media, that fits the theme: Jurassic World.